This Black-eared Fairy was constructing a nest at Virua National Park. Photo by guide Micah Riegner. The state of Roraima in northern Brazil is a land of biotic extremes: a Tepui archipelago in sea of palm-ribboned savannas, cerrados, campinas, and majestic hardwood forest. 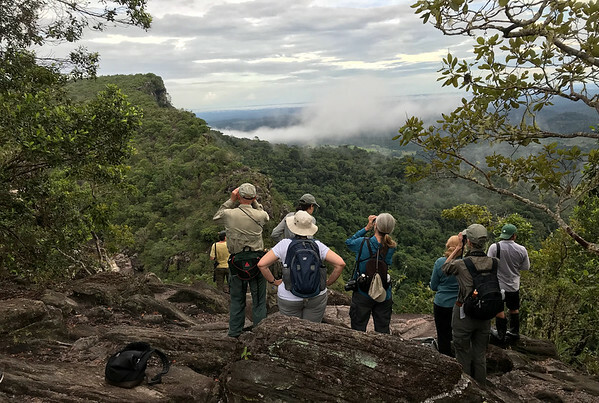 For several years Bret and I have talked (dreamed) of scouting out this remarkable corner of Brazil and this year we did just that, along with 10 other lucky birders. We drove through some awe-inspiring landscapes, saw some impressive birds, overshot a couple turnoffs (we eventually got to where we needed to go!) and managed to keep our feet dry most of the time, despite the paucity of dry land due to a prolonged rainy season. The trip was punctuated by many highlights; we were dazzled by a male Ruby Topaz, bewildered by whirling flocks of Tepui Swifts over Serra do Tepequem, and stunned by the crisp white dots lining the undertail of Rio Branco Antbird! Our adventure began in the city of Boa Vista, where we birded some gallery woodland on the outskirts of town. Lesser Horneros patrolled the wet grass while White-chinned Swifts streamed by overhead, probably on their way to roosting sites in the mountains. The next morning, we shot north on the BR-174 through flat, flooded savannas where Bret called out a Bearded Tachuri (the brevipennis form, that is), a tough-to-see tyrannic of pristine grasslands. Our stop along the Rio Uraricuera was extremely productive. It didn’t take long before we had Hoary-throated Spinetail, Slate-headed Tody-tyrant, Fuscous Flycatcher and Flavescent Warbler too close for binos! Continuing north toward Serra do Tepequem, the marshes were dotted with Jabirus, Whistling Ducks, and the occasional Savanna Hawk. Serra do Tepequem was delightful, to say the least. We struggled getting through our first lunch there because we were continually interrupted by Sooty-capped Hermit, Red-shouldered Macaws, and Tepui Swifts swooping low right in front of us! At Mirante da Paiva, the edge of the plateau, the fog lifted exposing a tremendous gorge and rolling forested hills as far as the eye could see. Mike spotted a pair of Red-and-green Macaws eating clay; they were mere specks on a distant cliff. That same afternoon we were surprised to find a Tiny Hawk, which was just fabulous through the scope. We could even see that dark red eye. Tepequem turned out to be fabulous for raptors. The following day we saw Short-tailed Hawk, a dark morph White-tailed Hawk, Zone-tailed Hawks, Double-toothed Kite, and over 60 Swallow-tailed Kites streaming overhead. Our original plan was to leave Tepequem and arrive in Boa Vista in time for lunch and continue to Caracarai, but that didn’t quite happen as there was just too much to see, so we ate at a little restaurant off the BR-174. Our first stop along the Rio Amajari yielded Azure Gallinule, a Hoatzin on a nest, and close views of Cinereous Becard. Farther along, we came across our first of 7 Giant Anteaters traversing the open Cerrado grasslands and a pair of Sharp-tailed Ibis, a bird we had been hoping to find. Our time in Caracarai was split between visits to Virua National Park and boat trips on the mighty Rio Branco. Our first morning we drove down the Estrada Perdida or the “Lost Road.” It was constructed as the original path of the BR-174 linking Manaus to Boa Vista but was abandoned because of flooding and loss of construction equipment. Turns out it’s great for birding! As soon as we got out of the van we heard the distinctive song of White-naped Seedeater, a bird only known from campinas (white sand savannas) of Brazil and Venezuela. Bret called it in and we could even see the little white crescent below the eye. We also flushed a White-tailed Nightjar in our attempts to see the seedeater. On our way back for lunch we stopped to check out three large birds that were on the road ahead of us. They were Crestless Curassows! We piled out of the van and saw them through the scope before they ducked into the vegetation. Virua is probably the best place to see this elusive cracid of northern South America. We decided to take two boat trips on the Rio Branco for two reasons: because few birders have spent much time on the Branco and because boat trips are a fun, relaxing way to see a lot of birds. Our first trip we went upstream from Caracarai on a clunky blue boat dragging 2 voadeiras (metal motor boats). We explored a narrow igarape (creek) where we had encounters with Dot-backed Antbird and Striped Woodcreeper. We then swung around to an island where we saw the first Scarlet Macaws of the trip and a group of Bare-necked Fruitcrows with impressive blue facial skin. On our second boat trip we ended up just taking the voadeiras downstream, to visit some islands where we saw Lesser Wagtail-Tyrant, Amazonian Umbrellabirds, White-bellied Piculet, and Klages’s Antwren. For many of us, the highlight of the trip was seeing the Rio Branco Antbird. It was a bird we looked for all morning on our first boat trip, but just couldn’t find it. That afternoon we walked a side road near the bridge at Caracarai and, sure enough, we found a pair that put on quite the show—white dots and all. Not only that, we even found the nest, a small woven cup above the water. Bret waded into the water up to his waist in order to get some close-up shots of it because it’s probably undescribed. Our final morning of birding around Caracarai found us along the Estrada Cujubim, a dirt road winding through a variety of habitat types. The best bird of the morning was Willis’s Antbird, actually, three of them foraging close to the ground. We even saw one catch a moth. After packing up, we drove back to Boa Vista and concluded the tour in Manaus the following day. Despite all that water we had to work around, we pulled off a smooth, dry, trip. Special thanks to Elias for helping with the food shopping, Paulo for showing us around, Gerusa for preparing some delicious meals, and Carlos for getting us where we needed to go, even if that meant looking for onion fields outside of Boa Vista. Bret and I would like to thank you all, too, for joining us on this adventure. We had a fabulous time and look forward to birding with you again. Birding at Serra do Tepequem. Photo by guide Bret Whitney. GREAT TINAMOU (Tinamus major) – One crossed the road near Caracarai. WHITE-FACED WHISTLING-DUCK (Dendrocygna viduata) – Common in the flooded fields throughout the tour. BLACK-BELLIED WHISTLING-DUCK (Dendrocygna autumnalis) – Seen along the drive between Boa Vista and Serra do Tepequem. MUSCOVY DUCK (Cairina moschata) – Seen on our boat trips on the Rio Branco. VARIABLE CHACHALACA (Ortalis motmot) – A few seen on the outskirts of Boa Vista and at Serra do Tepequem. CRESTLESS CURASSOW (Mitu tomentosum) – Awesome! One of the highlights of the trip. We were on our way back on the Estrada Perdida when we saw a group of 3 birds ahead of us on the road. We all managed to get out of the van without scaring the birds away. Nice work team! BLACK CURASSOW (Crax alector) – Mike alerted us to a pair crossing the road near the park entrance at Virua. Good eye! CRESTED BOBWHITE (Colinus cristatus) – We heard these throughout the tour and finally had good looks at them along the road near Caracarai. MAGUARI STORK (Ciconia maguari) – A few seen in flight at Virua National Park. NEOTROPIC CORMORANT (Phalacrocorax brasilianus) – Seen along the Rio Branco. COCOI HERON (Ardea cocoi) – Some seen along the Rio Branco. These magnificent herons resemble Great Blues. STRIATED HERON (SOUTH AMERICAN) (Butorides striata striata) – Common throughout the tour. CAPPED HERON (Pilherodius pileatus) – Some seen along the Rio Branco. BLACK-CROWNED NIGHT-HERON (Nycticorax nycticorax) – Some reported one flying over Caracarai. BOAT-BILLED HERON (Cochlearius cochlearius) – Our boatman, Savio, spotted a juvenile sitting motionless in some dense vegetation off the Rio Branco. 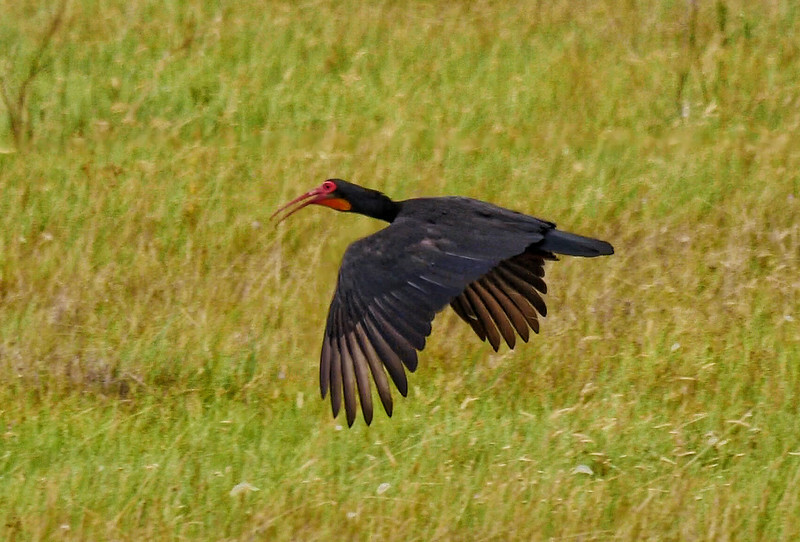 Sharp-tailed Ibis is a strange-looking bird and the only member of its genus. It occurs in savannas throughout northern South America. We were lucky to see a pair along the drive back from Tepequem. Bret managed to snap this photo as they flew along the road. SHARP-TAILED IBIS (Cercibis oxycerca) – Great to see these dinosaur-like birds along the drive from Serra do Tepequem to Boa Vista. This species only occurs in grasslands of northern South America. GREEN IBIS (Mesembrinibis cayennensis) – A couple seen in Virua NP. BUFF-NECKED IBIS (Theristicus caudatus) – Pairs seen along the BR-174. LESSER YELLOW-HEADED VULTURE (Cathartes burrovianus) – Seen in the open savannas throughout the trip. KING VULTURE (Sarcoramphus papa) – We had great views of a bird soaring along the main road at Serra do Tepequem. OSPREY (Pandion haliaetus) – A couple seen along the Rio Branco. PEARL KITE (Gampsonyx swainsonii) – Remarkably common in the Cerrado habitat on the drive from Boa Vista to Serra do Tepequem. WHITE-TAILED KITE (Elanus leucurus) – One flew over us at the Estrada Agua Boa outside Caracarai. SWALLOW-TAILED KITE (Elanoides forficatus) – A flock of over 60 birds flew over us at Serra do Tepequem! BLACK HAWK-EAGLE (Spizaetus tyrannus) – One seen flying across the Rio Branco. BLACK-COLLARED HAWK (Busarellus nigricollis) – Seen soaring over the Rio Amajari. SNAIL KITE (Rostrhamus sociabilis) – Fairly common throughout the trip. DOUBLE-TOOTHED KITE (Harpagus bidentatus) – Seen soaring at Serra do Tepequem. Resembles an Accipiter in flight. PLUMBEOUS KITE (Ictinia plumbea) – Relatively common along the Rio Branco. TINY HAWK (Accipiter superciliosus superciliosus) – Wow! What a view! We watched one near the overlook at Serra do Tepequem. CRANE HAWK (Geranospiza caerulescens) – Several seen on our boat trip downstream on the Rio Branco. SAVANNA HAWK (Buteogallus meridionalis) – Common throughout the trip. GREAT BLACK HAWK (Buteogallus urubitinga) – Several seen along the Rio Branco. WHITE-TAILED HAWK (Geranoaetus albicaudatus) – We saw a fabulous dark morph circling over us at Serra do Tepequem with distinctive long wings and short, broad tail. GRAY-LINED HAWK (Buteo nitidus) – Seen in Boa Vista. SHORT-TAILED HAWK (Buteo brachyurus) – We saw a subadult flying right over the hotel in Boa Vista. Also seen at Serra do Tepequem. ZONE-TAILED HAWK (Buteo albonotatus) – Two seen soaring with vultures at Serra do Tepequem. PAINT-BILLED CRAKE (Mustelirallus erythrops) – Fantastic! Paulo brought us to a soccer field in Caracarai where we saw a couple birds running around in the flooded grass. Obrigado Paulinho! PURPLE GALLINULE (Porphyrio martinica) – Seen way across the way at our stop on the Rio Amajari. AZURE GALLINULE (Porphyrio flavirostris) – Bret called out a pair that were in a flooded field near the Rio Amajari. LIMPKIN (Aramus guarauna) – Seen in the wetlands along the BR-174. GRAY-WINGED TRUMPETER (Psophia crepitans) – Great looks at the bird hanging around the field station at Virua National Park. COLLARED PLOVER (Charadrius collaris) – We saw one hanging out on the pavement outside our hotel in Caracarai! SOLITARY SANDPIPER (Tringa solitaria) – One lone individual at a puddle along the road outside Caracarai. YELLOW-BILLED TERN (Sternula superciliaris) – Seen on our second boat trip on the Rio Branco. LARGE-BILLED TERN (Phaetusa simplex) – Seen at Virua and along the Rio Branco. PALE-VENTED PIGEON (Patagioenas cayennensis) – Common throughout the tour. SCALED PIGEON (Patagioenas speciosa) – Seen along the Estrada Perdida at Virua. This Red-shouldered Macaw was right outside the restaurant at Tepequem. Photo by guide Micah Riegner. RUDDY QUAIL-DOVE (Geotrygon montana) – Seen briefly in the forest at Virua National Park. WHITE-TIPPED DOVE (Leptotila verreauxi) – Common throughout the tour. EARED DOVE (Zenaida auriculata) – The Mourning Dove look-alike along the BR-174. HOATZIN (Opisthocomus hoazin) – Sitting on a nest near the Rio Amajari! GREATER ANI (Crotophaga major) – Several seen on both boat trips on the Rio Branco. SMOOTH-BILLED ANI (Crotophaga ani) – Ubiquitous throughout the tour. STRIPED CUCKOO (Tapera naevia) – We flushed one along the Estrada Perdida at Virua. LITTLE CUCKOO (Coccycua minuta) – We called one in on one of the river islands on the Rio Branco. SQUIRREL CUCKOO (Piaya cayana) – Fairly common throughout the tour. DARK-BILLED CUCKOO (Coccyzus melacoryphus) – Nice! We saw one at our stop along the Rio Uraricoera. PEARLY-BREASTED CUCKOO (Coccyzus euleri) – We saw this Yellow-billed Cuckoo look-alike along the Estrada Cujubim across from Caracarai. FERRUGINOUS PYGMY-OWL (Glaucidium brasilianum) – Fairly common at Serra do Tepequem. We had great looks at one right behind the restaurant where we had our first lunch. LEAST NIGHTHAWK (Chordeiles pusillus) – We saw a couple Esmeraldae types flying over the Estrada Agua Boa outside Caracarai. LESSER NIGHTHAWK (Chordeiles acutipennis) – One flew overhead when we were on the outskirts of Boa Vista. BAND-TAILED NIGHTHAWK (Nyctiprogne leucopyga) – We saw these circling around us at dusk along the Estrada Perdida. The genus Nyctiprogne translates to "night martin." WHITE-TAILED NIGHTJAR (Hydropsalis cayennensis) – It was great to see these birds along the Estrada Perdida. We even observed the tail popping display. What a strange sound! COMMON POTOO (Nyctibius griseus) – Seen behind the restaurant at Tepequem and along the Estrada Perdida at Virua National Park. WHITE-CHINNED SWIFT (Cypseloides cryptus) – A few flew over us on the outskirts of Boa Vista. TEPUI SWIFT (Streptoprocne phelpsi) – Nossa! What a great birding experience! A flock of over 100 birds flew through while we were eating lunch up at Tepequem. We even saw their rufous throats! SHORT-TAILED SWIFT (Chaetura brachyura) – Fairly common around the towns we visited. BAND-RUMPED SWIFT (Chaetura spinicaudus) – A few individuals seen flying over the base camp at Virua National Park. LESSER SWALLOW-TAILED SWIFT (Panyptila cayennensis) – One flew over us on the Rio Branco. FORK-TAILED PALM-SWIFT (Tachornis squamata) – Common throughout Roraima. These swifts will rob feathers off the backs of other birds to insulate their nests. LONG-TAILED HERMIT (Phaethornis superciliosus) – Seen briefly at Virua. STREAK-THROATED HERMIT (Phaethornis rupurumii) – A few buzzed past us while we were birding in the varzea along the Rio Branco. REDDISH HERMIT (Phaethornis ruber) – One buzzed past us while we were birding along the Rio Branco. SOOTY-CAPPED HERMIT (Phaethornis augusti) – We had several nice encounters with this bird at Serra do Tepequem! This species is not even in the Birds of Brazil book. Micah and Elias found a Black-eared Fairy building a nest while they were scouting out Virua National Park. We came back 12 days later, and sure enough the bird was still working away! BLACK-EARED FAIRY (Heliothryx auritus) – While I was scouting with Elias, we watched a female collecting nesting material along the main road at Virua. Sure enough she was still building the nest when we arrived with the group 12 days later. What a treat! GREEN-TAILED GOLDENTHROAT (Polytmus theresiae) – We saw a couple of these along the Estrada Agua Boa behind Caracarai. RUBY-TOPAZ HUMMINGBIRD (Chrysolampis mosquitus) – Just outstanding. We watched a male attending pink flowers at Serra do Tepequem. BLACK-THROATED MANGO (Anthracothorax nigricollis) – A female was hanging around Mirante da Paiva at Serra do Tepequem. BLUE-TAILED EMERALD (Chlorostilbon mellisugus) – Seen our last morning at Serra do Tepequem. GRAY-BREASTED SABREWING (Campylopterus largipennis) – "Above the fork, left of the arching vine, beneath the diagonal." GLITTERING-THROATED EMERALD (Amazilia fimbriata) – Seen around Boa Vista. WHITE-CHINNED SAPPHIRE (Hylocharis cyanus) – Seen at Virua National Park. GREEN-BACKED TROGON (Trogon viridis) – We had great views of this bird outside Boa Vista and at Virua National Park. PIED PUFFBIRD (Notharchus tectus) – We saw a pair nesting in a termite mound at Serra do Tepequem. SPOTTED PUFFBIRD (Bucco tamatia) – We bumped into this bird quite a few times near Caracarai. These were also nesting in a termite mound. BROWN JACAMAR (Brachygalba lugubris) – This was one of our first birds at Serra do Tepequem. It was sitting out on a telephone wire. GREEN-TAILED JACAMAR (Galbula galbula) – Fairly common at Tepequem. GREEN ARACARI (Pteroglossus viridis) – Seen along the Estrada Cujubim across from Caracarai. BLACK-NECKED ARACARI (Pteroglossus aracari) – We saw a pair our last morning along the Estrada Cujubim. MANY-BANDED ARACARI (Pteroglossus pluricinctus) – It was great to see this species along the left bank of the Rio Branco as we motored upstream. TOCO TOUCAN (Ramphastos toco) – Scope views of a bird at our Rio Uraricoera stop. CHANNEL-BILLED TOUCAN (Ramphastos vitellinus) – Fairly common throughout the trip. GOLDEN-SPANGLED PICULET (Picumnus exilis) – We had nice views of this bird at Tepequem and around Caracarai. WHITE-BELLIED PICULET (Picumnus spilogaster) – Seen on one of the islands in the Rio Branco. We also encountered this bird in Boa Vista. GOLDEN-COLLARED WOODPECKER (Veniliornis cassini) – We called one in at Serra do Tepequem. It was nice to document this bird on the right bank of the Rio Branco. SPOT-BREASTED WOODPECKER (Colaptes punctigula) – We had awesome views of this bird on one of the river islands in the Rio Branco. CHESTNUT WOODPECKER (Celeus elegans) – Quite a handsome bird. We saw one in the tall forest at Virua National Park. APLOMADO FALCON (Falco femoralis) – We stopped at a gas station our first morning on our way to Tepequem and saw a pair perched out on a metal tower. ORANGE-WINGED PARROT (Amazona amazonica) – Common throughout Virua National Park. GREEN-RUMPED PARROTLET (Forpus passerinus) – We saw this bird a few times in Boa Vista. BLACK-HEADED PARROT (Pionites melanocephalus) – We had to lower the scope in order to get the right angle, but it was well worth bending down to look at them. 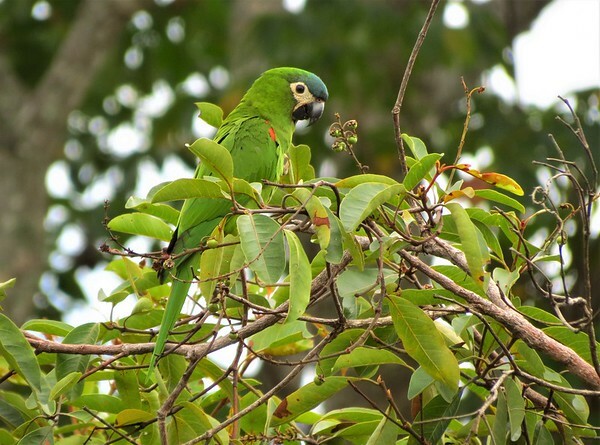 BROWN-THROATED PARAKEET (Eupsittula pertinax) – One of the most common birds in Boa Vista! Also common in Virua. RED-BELLIED MACAW (Orthopsittaca manilatus) – Common throughout the trip. These small macaws feed on Mauritia Palm fruits. RED-AND-GREEN MACAW (Ara chloropterus) – Fairly common around Serra do Tepequem. We saw a pair eating clay from a cliff. RED-SHOULDERED MACAW (Diopsittaca nobilis) – One of the highlights of the trip. We watched a flock feeding in a fruiting tree just 15 feet away from us at Serra do Tepequem. We could even hear their bills crunching through the hard nuts. BLACK-CRESTED ANTSHRIKE (Sakesphorus canadensis) – Common in the riverine forest along the Rio Uraricoera and Rio Branco. NORTHERN SLATY-ANTSHRIKE (Thamnophilus punctatus) – It was nice to see a pair of these at Virua National Park. AMAZONIAN ANTSHRIKE (Thamnophilus amazonicus) – We saw the cinereceps form of this tail-wagging antshrike at Virua National Park. It has a gray crown as opposed to a black crown. CHERRIE'S ANTWREN (Myrmotherula cherriei) – We called in a male in some flooded campinarana near Caracarai. This bird was named after Gorge Cherrie, the ornithologist on the Roosevelt expedition on the River of Doubt. KLAGES'S ANTWREN (Myrmotherula klagesi) – We called in a male that was singing in some flooded forests along the Rio Branco. SPOT-BACKED ANTWREN (Herpsilochmus dorsimaculatus) – We saw this bird well in stunted forest at Virua. We saw some great antbirds on the tour. Here's a video that Bret put together. The bird labeled "Ferruginous Antbird" is a Ferruginous-backed Antbird. WHITE-FRINGED ANTWREN (Formicivora grisea) – Fairly common throughout the tour. 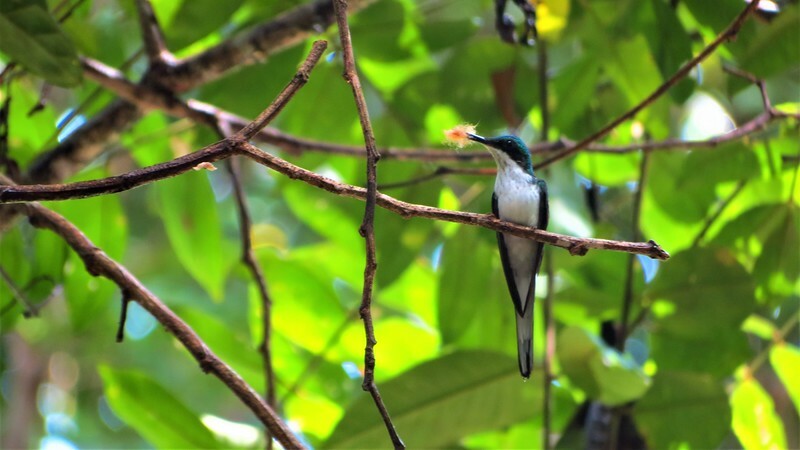 We had our best looks at this bird at the Rio Uraricoera. GUIANAN WARBLING-ANTBIRD (Hypocnemis cantator) – Probably the most cooperative Warbling-Antbird Bret and I have ever seen! This bird was near the base camp at Virua National Park. WILLIS'S ANTBIRD (Cercomacroides laeta) – A family group was foraging right in front of us along the Estrada Cujubim across from Caracarai. We even saw one catch a moth! DUSKY ANTBIRD (Cercomacroides tyrannina) – Three feet above the green dot in a dense vine tangle at Virua National Park. RIO BRANCO ANTBIRD (Cercomacra carbonaria) – For many people this was the bird of the trip! We found an extremely obliging pair near Caracarai and even found a nest. Bret waded into the water up to his waist in order to get some shots of it. WHITE-BROWED ANTBIRD (Myrmoborus leucophrys) – We saw these when we got out on our first boat trip up the Rio Branco. BLACK-HEADED ANTBIRD (Percnostola rufifrons) – Also known as the "bluetooth antbird." FERRUGINOUS-BACKED ANTBIRD (Myrmoderus ferrugineus) – What a stunner! We saw both male and female walking on the ground in Virua National Park. I love that electric blue orbital skin they have. DOT-BACKED ANTBIRD (Hylophylax punctulatus) – This little antbird sat long enough for all of us to get bins on it. PLAIN-BROWN WOODCREEPER (Dendrocincla fuliginosa) – We saw a pair along the trail at Virua. WEDGE-BILLED WOODCREEPER (Glyphorynchus spirurus) – Nice! We actually saw this bird at night sleeping about 3 ft off the ground on a large trunk the same way Leaftossers sleep. STRIPED WOODCREEPER (Xiphorhynchus obsoletus) – It flew in and landed near our boats while we were exploring a side channel off the Rio Branco. This is one of the birds I'm studying for my thesis. It is quite the acrobat, often running upside down along thin branches. STRAIGHT-BILLED WOODCREEPER (Dendroplex picus) – This is another woodcreeper I'm studying. We saw a cooperative individual near Caracarai and in the campinas at Virua. STREAK-HEADED WOODCREEPER (Lepidocolaptes souleyetii) – We found this bird on our final morning of birding in Boa Vista. LESSER HORNERO (Furnarius minor) – We watched a pair in Boa Vista. These birds seemed to be much richer in color compared to those on the Amazon. CHESTNUT-CROWNED FOLIAGE-GLEANER (Automolus rufipileatus) – We saw this bird our final morning of birding along the Estrada Cujubim. BUFF-THROATED FOLIAGE-GLEANER (Automolus ochrolaemus) – We had fair views of this bird in the terra firme at Virua National Park. RUSTY-BACKED SPINETAIL (Cranioleuca vulpina) – There was a small family group of these noisy spinetails near where we saw the Rio Branco Antbird. PALE-BREASTED SPINETAIL (Synallaxis albescens) – We had great views of this skulker below Serra do Tepequem. HOARY-THROATED SPINETAIL (Synallaxis kollari) – Fantastic! A pair came in so close we could barely focus with binoculars while we were birding the Rio Uraricoera. This endangered furnariid is found only in Roraima and adjacent Guyana. WHITE-LORED TYRANNULET (Ornithion inerme) – This little tyrannulet with white dots on the wing appeared briefly as we were birding the main road at Virua National Park. MOUSE-COLORED TYRANNULET (Phaeomyias murina) – Seen in the low shrubby habitat around Serra do Tepequem. YELLOW TYRANNULET (Capsiempis flaveola) – This bird was somewhat of a surprise. We had a pair in some flooded forest along the Rio Branco. BEARDED TACHURI (Polystictus pectoralis) – Awesome! We called a pair in along the BR-174 on our way out to Serra do Tepequem. The subspecies brevipennis occurs only in savannas in northern South America. GRAY ELAENIA (Myiopagis caniceps) – Seen high in the canopy at Virua. YELLOW-BELLIED ELAENIA (Elaenia flavogaster) – Common up at Serra do Tepequem. SMALL-BILLED ELAENIA (Elaenia parvirostris) – A few were seen along the road below Tepequem. Distinguished from the more common Yellow-bellied Elaenia by its rounded head and contrast between the dark auriculars and pale throat. PLAIN-CRESTED ELAENIA (Elaenia cristata) – We had good looks at one that was in the low shrubby vegetation at Tepequem. LESSER ELAENIA (Elaenia chiriquensis) – Seen along the Estrada Perdida. RUFOUS-CROWNED ELAENIA (Elaenia ruficeps) – We called one out in the campinarana habitat outside Caracarai. OCHRE-BELLIED FLYCATCHER (Mionectes oleagineus) – This fruit-eating flycatcher was seen in stunted forest at Virua National Park. SLENDER-FOOTED TYRANNULET (Zimmerius gracilipes) – This was the Zimmerius we saw giving the dawn song at Mirante da Paiva at Tepequem. Apparently the Rio Branco separates this species from the Guianan Tyrannulet. GUIANAN TYRANNULET (Zimmerius acer) – Relatively common in Virua National Park. PALE-TIPPED TYRANNULET (Inezia caudata) – We had our best looks at this bird at the Rio Uraricoera. LESSER WAGTAIL-TYRANT (Stigmatura napensis) – Nice! This dapper tyrannid appeared on one of the islands on the Rio Branco. The population on the Rio Branco is disjunct from that of the Amazon. 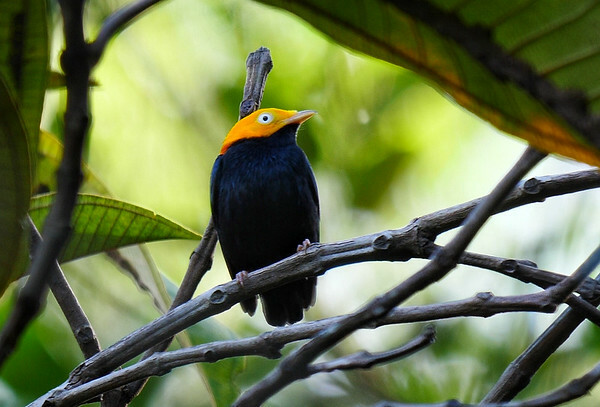 This Golden-headed Manakin was feeding on small Melastome fruits off the side of the road. Photo by guide Bret Whitney. HELMETED PYGMY-TYRANT (Lophotriccus galeatus) – Seen a few times at Tepequem and Virua. PEARLY-VENTED TODY-TYRANT (Hemitriccus margaritaceiventer) – These were unusually quiet, but we saw one along the Estrada Perdida while we were looking for Yapacana Antbird. SLATE-HEADED TODY-FLYCATCHER (Poecilotriccus sylvia) – Excellent views along the Rio Uraricoera. SPOTTED TODY-FLYCATCHER (Todirostrum maculatum) – Fairly common along the Rio Branco. COMMON TODY-FLYCATCHER (Todirostrum cinereum) – Seen around Tepequem and Boa Vista. PAINTED TODY-FLYCATCHER (Todirostrum pictum) – We saw this guy way up in the canopy on our last morning of birding around Caracarai. YELLOW-MARGINED FLYCATCHER (Tolmomyias assimilis) – Seen in a canopy feeding flock a Virua. YELLOW-BREASTED FLYCATCHER (Tolmomyias flaviventris) – Fairly common around Virua. FUSCOUS FLYCATCHER (FUSCOUS) (Cnemotriccus fuscatus fumosus) – Seen at close range along the Rio Uraricoera. FUSCOUS FLYCATCHER (FUSCOUS) (Cnemotriccus fuscatus fuscatior) – This is the subspecies that occurs on whitewater river islands. We saw one on our boat trip on the Rio Branco. DRAB WATER TYRANT (Ochthornis littoralis) – A few birds were along the Rio Branco. WHITE-HEADED MARSH TYRANT (Arundinicola leucocephala) – Several seen along the Br-174. PALE-BELLIED MOURNER (Rhytipterna immunda) – We saw this white-sand forest specialist along the road outside Caracarai. Muito bom! DUSKY-CAPPED FLYCATCHER (Myiarchus tuberculifer) – Seen in the canopy of the forest at Virua National Park. It's just amazing that this same species occurs all the way up into Arizona. SWAINSON'S FLYCATCHER (Myiarchus swainsoni) – We saw a pair along the Estrada Agua Boa outside of Caracarai. YELLOW-THROATED FLYCATCHER (Conopias parvus) – Seen in a canopy flock at Virua National Park. THREE-STRIPED FLYCATCHER (Conopias trivirgatus) – We called out a pair along the Rio Branco. SULPHURY FLYCATCHER (Tyrannopsis sulphurea) – A few seen at Serra do Tepequem. WHITE-THROATED KINGBIRD (Tyrannus albogularis) – A few of these austral migrants were seen in Caracarai. The dark mask and clean white throat with a lack of a dusky breast band separate this species from Tropical Kingbird. AMAZONIAN UMBRELLABIRD (Cephalopterus ornatus) – Nossa! We bumped into a couple of these raven-sized cotingas on our boat trip along the Rio Branco. POMPADOUR COTINGA (Xipholena punicea) – We saw a female-plumage bird at the Estrada Agua Boa. BARE-NECKED FRUITCROW (Gymnoderus foetidus) – Wow, what a crazy-looking bird! There was a small group on one of the river islands in the Rio Branco. TINY TYRANT-MANAKIN (Tyranneutes virescens) – Seen on the grid trail at Virua National Park. BLACK MANAKIN (Xenopipo atronitens) – Male and female were seen in the stunted forest at Virua. WHITE-CROWNED MANAKIN (Dixiphia pipra) – An adult male was foraging on melastome fruits along the Estrada Cujubim across from Caracarai. GOLDEN-HEADED MANAKIN (Ceratopipra erythrocephala erythrocephala) – Feeding in the same tree with the White-crowned Manakin. BLACK-TAILED TITYRA (Tityra cayana) – We found a pair foraging in a canopy flock at Virua. WHITE-WINGED BECARD (Pachyramphus polychopterus) – Both male and female were building a nest below Serra do Tepequem. ASHY-HEADED GREENLET (Hylophilus pectoralis) – One continued to fly right over us at the Rio Uraricoera. RED-EYED VIREO (Vireo olivaceus) – We saw a couple of the Chivi migrants in Virua National Park. VIOLACEOUS JAY (Cyanocorax violaceus) – Flocks of these noisy jays patrolled Serra do Tepequem. CAYENNE JAY (Cyanocorax cayanus) – We not only saw a flock of these stunning jays, we found a nest at Virua National Park! Wow! BLACK-COLLARED SWALLOW (Pygochelidon melanoleuca) – This swallow typically occurs around rapids throughout the Amazon Basin. We saw several just perched out on the boat dock in Caracarai. BICOLORED WREN (Campylorhynchus griseus) – We saw several of these handsome wrens around Boa Vista. CORAYA WREN (Pheugopedius coraya) – We encountered a pair along the main road a Tepequem. TROPICAL GNATCATCHER (Polioptila plumbea) – Seen in Boa Vista. SPECTACLED THRUSH (Turdus nudigenis) – Nice! This bird appeared at the Rio Uraricoera while we were watching Hoary-throated Spinetails. BLACK-BILLED THRUSH (CAMPINA) (Turdus ignobilis arthuri) – Seen in the low shrubby vegetation at Serra do Tepequem. TROPICAL MOCKINGBIRD (Mimus gilvus) – Common in the open fields around Boa Vista. 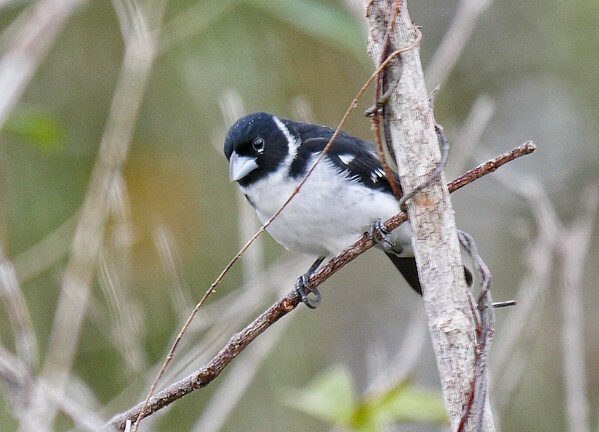 White-naped Seedeaters only occur in Campinas. We were eye to eye with this bird along the Estrada Perdida at Virua National Park. Photo by guide Bret Whitney. FLAVESCENT WARBLER (Myiothlypis flaveola) – This loud warbler came in to pygmy owl hooting at the Rio Uraricoera. BLACK-FACED TANAGER (Schistochlamys melanopis) – Common up at Tepequem. We saw a few at Virua. HOODED TANAGER (Nemosia pileata) – A pair was seen feeding in a park in Boa Vista. FULVOUS-CRESTED TANAGER (Tachyphonus surinamus) – Fairly common in Virua National Park. RED-SHOULDERED TANAGER (Tachyphonus phoenicius) – It was great to see these birds in Tepequem. They often occur in open areas with scattered shrubs. SPOTTED TANAGER (Ixothraupis punctata) – One came into our pygmy owl whistling at Virua National Park. BURNISHED-BUFF TANAGER (Tangara cayana) – Common throughout the tour. MASKED TANAGER (Tangara nigrocincta) – What a beauty. We saw these at Mirante da Paiva at Tepequem. YELLOW-BELLIED DACNIS (Dacnis flaviventer) – Seen along the Rio Branco. SAFFRON FINCH (Sicalis flaveola) – Common throughout Roraima. BLUE-BLACK GRASSQUIT (Volatinia jacarina) – We saw males displaying along the main road at Tepequem. LINED SEEDEATER (Sporophila lineola) – A few birds seen in Boa Vista. RUDDY-BREASTED SEEDEATER (Sporophila minuta) – Seen the first morning on our drive to Tepequem. CHESTNUT-BELLIED SEED-FINCH (Sporophila angolensis) – Wow, never seen so many of these before! They are trapped throughout much of Brazil to be sold as pets. GRAY SEEDEATER (Sporophila intermedia) – Fairly common in most open habitats we visited. Nice bright yellow bill. WHITE-NAPED SEEDEATER (Sporophila fringilloides) – Sweet! We had up-close views of this campina specialist. Virua National Park is one of the best places in the world to see this bird. YELLOW-BELLIED SEEDEATER (Sporophila nigricollis) – Fairly common in the clearings around Tepequem. PLUMBEOUS SEEDEATER (Sporophila plumbea) – Seen in the flooded fields along the BR-174. BLACK-STRIPED SPARROW (Arremonops conirostris) – Virginia spotted this one at Serra do Tepequem. Nice find! RUFOUS-COLLARED SPARROW (Zonotrichia capensis) – Seen in the shrubby habitat at Serra do Tepequem. GREEN OROPENDOLA (Psarocolius viridis) – A male was displaying at Serra do Tepequem. RED-RUMPED CACIQUE (Cacicus haemorrhous) – Some seen at Virua. ORANGE-BACKED TROUPIAL (Icterus croconotus) – Wow, we saw one hopping on the ground at Boa Vista. YELLOW ORIOLE (Icterus nigrogularis) – Seen several times throughout the tour. We had our best looks in Boa Vista. VIOLACEOUS EUPHONIA (Euphonia violacea) – We found a family group of these on the main road to Serra do Tepequem. 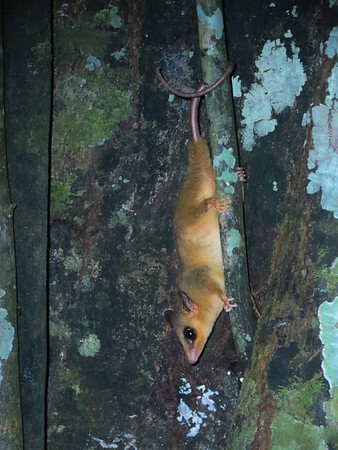 This Linnaeus's Mouse Opossum was seen on our night walk at Virua National Park. These diminutive marsupials feed on fruit, insects, and whatever else they can catch. This one froze right in front of us allowing us to get close-up views. Photo by guide Micah Riegner. LINNAEUS'S MOUSE OPOSSUM (Marmosa murina) – One of my favorite mammals of the trip. We watched one along the boardwalk at Virua National Park. COMMON OPOSSUM (Didelphis marsupialis) – Seen during our night walk at Virua. GOLDEN-HANDED TAMARIN (Saguinus midas) – There was a small group along the main road to Virua. BROWN BEARDED SAKI MONKEY (Chiropotes satanas) – We stopped to see a lone male along the Rio Branco. GIANT ANTEATER (Myrmecophaga tridactyla) – Wow, what a highlight! We counted 6 along the drive from Tepequem to Boa Vista and then saw a 7th in Virua while we were watching Ferruginous-backed Antbirds. GUIANAN SQUIRREL (Sciurus aestuans) – Seen at Virua. CAPYBARA (Hydrochaeris hydrochaeris) – Seen along the road to Virua. RED-RUMPED AGOUTI (Dasyprocta agouti) – Common along the main road in Virua. These guinea-pig-like rodents are important dispersers of Brazil Nut Trees. AMAZON RIVER DOLPHIN (Inia geoffrensis) – Some very pale individuals were seen on our boat trip on the Rio Branco. CRAB-EATING FOX (Cerdocyon thous) – Two ran in front of our van as drove down the Estrada Perdida. GOLDEN TEGU (Tupinambis teguixin) – Seen at Virua and Serra do Tepequem. BLACK CAIMAN (Melanosuchus niger) – Right on the road at Virua! SMOKY JUNGLE FROG (Leptodactylus pentadactylus) – We heard and saw these on our night walk at Virua.